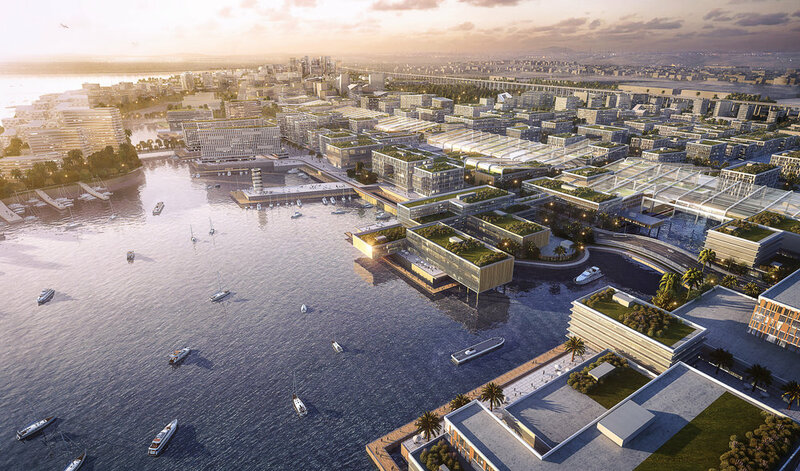 Following a conceptual design proposal submitted along with 140+ applicants, Tekuma Frenchman was selected with 6 firms to pursue a masterplan for Shenzhen New Marine City, the future flagship of Shenzhen representing its Blue Economy. It was awarded the 1st prize by a jury of international experts and local planning authorities. The proposal “Ocean Edge, Return of the Mangroves” and its implementation is underway with Tekuma Frenchman advising the local planning institute. Designed a 21st century ocean living edge which integrated flood prevention strategies to a mangrove revival plan. This enables the revitalization of the coastal ecology while promoting safe development of the shore. Provided a multi-level street network which separated BRT, freight and logistics vehicles from pedestrians through an elevated central spine, and a peripheral ring which naturally slopes towards the water. Introduced a centerpiece infrastructure, a pier which extends from the world’s largest convention center to the waterfront and hosts entertainment and exhibition venues, offices, restaurants and a ferry terminal.